With our 14 day, total immersion, Private Pilot Training, you can be on your way to flying your own airplane in practically no time. 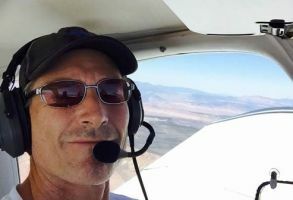 You will be training with one of the finest senior instructors in the US today, and work with that instructor, one on one, a minimum of 8 hours per day and training in very nice aircraft with a G430 / G530 or other GPS. This course is a total immersion program. We cover all training material in two weeks. You won’t have time to answer your cell phone, or solve any business problems. Accelerated flight training is the most demanding training you will ever undergo. The Airlines and Military train this way for a reason…..it works!! Retention of accelerated training is far superior compared to training that is spread out over several months, and saves you money. You will train in a relaxed environment, and we will do everything possible to make your stay a positive and memorable experience. . No prior flight experience required. This course includes the flight and ground instruction to meet the needs of an average student with good English language skills and ability. However, we can’t guarantee your certificate in two weeks. Your personal skills and the weather are somewhat beyond our control. If you require more time to finish we will work with you until you achieve your goal and become a Certified Private Pilot at the normal daily training rate. . 98% of all our Private Pilot students complete their training in 14 days or less. 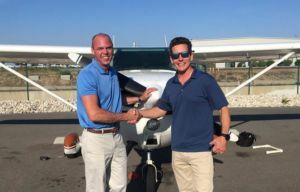 Upon completion of the program, you will be a Safe, Proficient and Confident Private Pilot, trained by one of the finest Senior Flight Instructors in the country. 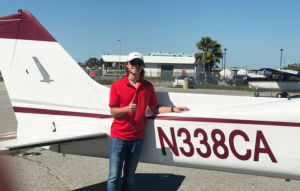 A Private Pilot’s License allows a pilot to fly a single-engine airplane under visual flight rules (VFR), referring to visibility of at least three miles, as well as at night. A private pilot may carry passengers but may not be paid for doing so, although the pilot can share operating expenses with the passengers. This physical must be conducted by an FAA-designated Airman Medical Examiner found here. During the exam you will be asked to fill out an FAA application and medical history form. The doctor will check your vision, hearing, balance, and nose and throat. The doctor will determine you do not have any mental or neurological problems such as alcoholism, epilepsy, psychosis, or a serious medical condition like chronic heart disease or diabetes mellitus. If you have a medical condition (even a serious one); it is still possible for you to get a license. However you need an AME to discuss your options (example, you may have to always fly with another licensed pilot present). The airman knowledge test examines you on the concepts and information you learned in your ground school training. It is a computerized exam that is administer before you start flight training. You will have two and a half hours to complete the 60 multiple-choice questions selected from the 700 plus airplane-related questions. Topics that you can be tested on, in the knowledge test, range from the current FARs to air traffic control information to cross-country flight planning. $13,600.00. A $1,000.00 deposit confirms your position on the training schedule. The balance is due ten days prior to the start of your program. Payments are not refundable but can be used for rescheduling within 6 months. We accept cash, checks, wire transfer, MasterCard and Visa. Price does not include the FAA Examiner fee. We recommend students purchase rental insurance, which is available at reasonable rates. Flight training at our Van Nuys, California facility is taught by our Chief Flight instructor who has been an aviation professional for over 37 years , Mature and Friendly, Commercial, Instrument, Multi Engine, including CFI and CFII for fixed wing single and multi-engine aircraft and rotorcraft helicopter with over 14,000 total flight hours and over 9,500 hours dual given. 4,000 hours of Instrument actual and simulated. Flight training at our Boulder Colorado facility is taught by our Chief Flight Instructor, an aviation professional for over 37 years. ATP, CFI, CFII and MEI with over 11.000 total flight hours and over 7500 hours of dual given. Flight training at our St. George, Utah Facility is taught by our Chief Flight Instructor, an aviation professional for over 30 years. CFI, CFII, MEI and ASE. 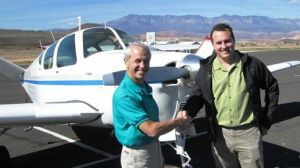 Flight Training at our Cedar City, Utah Location is taught by our Chief Flight Instructor an aviation professional for over 37 years, Mature and friendly, CFI, CFII, Commercial SEL and MEL and Glider with over 7,500 Total Logged hours, and over 4,500 hours of dual given. 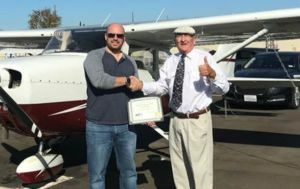 Flight training provided at our Sacramento, California facility is taught by our Chief Flight Instructor who is a certified GOLD SEAL flight instructor, CFI, CFII, MEI, IGI and AGI. 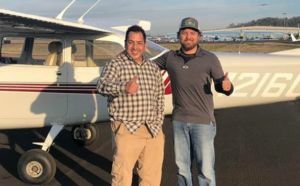 Flight training at our Georgetown, Texas facility is taught by our Chief Flight Instructor, an aviation professional for over 32 years, ATP, CFI, CFII, MEI, Commercial with over 13,000 Total Logged hours, and over 7,800 hours of dual given. 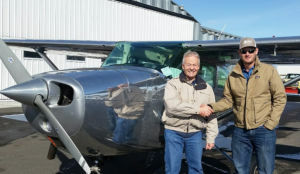 Flight Training at our Rexburg, Idaho facility is taught by our Chief Flight Instructor, an aviation professional for over 28 years, ATP, CFI, CFII, MEI with over 7,500 plus total Logged hours and over 3,900 hours dual given. Flight Training at our Salt Lake City, Utah Location is taught by our Chief Flight Instructor an aviation professional for over 46 years with over 13,000 total flight hours, over 4,000 hours dual given, and over 12,000 hours as evaluator in type rated aircraft as well as most single and twin engine aircraft. Instructor in BE-90 for FAA FSDO. 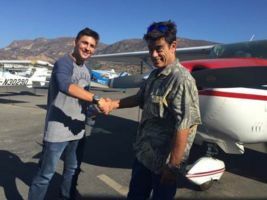 Flight Training at our Santa Paula, California Location is taught by our Chief Flight Instructor. 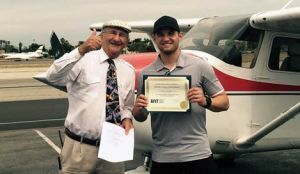 A Gold Seal Certified Flight Instructor, CFII, Commercial Airplane SEL with Instrument Rating, and tailwheel instructor also teaching Upset Recovery Training. 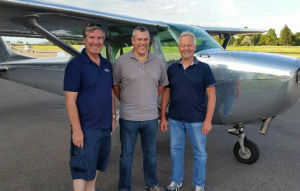 A member of the National Association of Flight Instructors (NAFI), the Cessna Pilots Association, and the Aircraft Owners and Pilots Association (AOPA). Teaching Primary, Instrument, and Commercial students. Flight Training at our Chattanooga, Tennessee Location is taught by our Chief Flight Instructor. An aviation professional for over 30 years, Mature and friendly, Over 30 years of diverse experience in aviation. CFI/CFII/MEI. Commercial Pilot: Airplane Single and Multiengine Land; Instrument-Airplane. 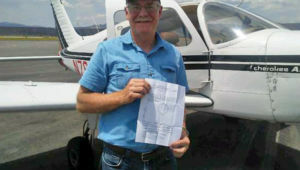 Certified Multiengine and Instrument Instructor. 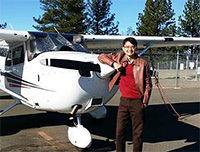 A professional FAA Senior Instructor with over 9,175 total hours, and 6,860 hours dual given as flight instructor. Flight Training at our Long Beach, California Location is taught by our Chief Flight Instructor. An aviation professional for over 18 years, Mature and friendly, FAA Airline Transport Pilot with EMB-145 type rating. Commercial Pilot, Certified Flight Instructor, Commercial Airplane SEL & MEL with Instrument Rating, Commercial Rotorcraft-Helicopter with Instrument Rating. Over 4,500 plus total Logged hours and over 3,300 hours dual given. Clients can rent and train in many different varieties of aircraft from steam gauge to Glass Panel at many of our locations, call for information. • Includes Flight Time (42 hours) Flight Instructor, and written Test. You must pass the basic medical exam that all applicants are required to undergo, certifying you meet the medical standards for safely operating an aircraft. FAA Knowledge Written test Certificate properly stamped with a grade of 80% or higher if possible. (70% is a minimum passing grade). A Private Pilot’s License requires a minimum of 40 hours of flight time, as well as extra time for study on the ground in preparation for the FAA written test. Applicants for the private license must be able to read, speak, and easily understand English. 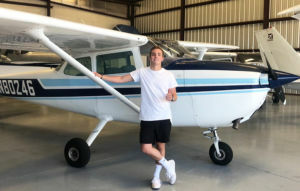 The FAA says you must be at least 16 years old to fly solo with a student pilot certificate, and 17 years old to get a pilot’s license. There is no upper age limit, provided that you are healthy enough to pass the basic medical exam. First of all, I want to say thanks to your whole AFIT organization and support staff for making this dream of mine come true. Especially, I want to show my immense appreciation my instructor Sam for his patience and for believing in me even when I doubted myself. 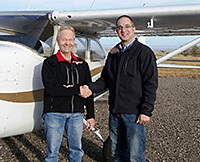 His experience, safety-oriented attitude, and engagement made for me to become a safe and proficient pilot. He will not settle for anything else but perfection. The training was intense and challenging but the result was as promised; I became a Private Pilot on my 14th day. For anyone out there that is considering this training; it works! Nevertheless, show ready to live and breathe piloting as it’s going to require all you have and some more. However, it was fun and the best part is that you are in the controls right from day one and won’t let go all the way until the end. Outstanding training concept and I will definitely come back when it is time for my IFR. Just wanted to take a moment to thank you for helping me fulfill my lifelong dream of becoming a pilot. Who knew that at age 53 I could go from a casual aviation observer to a certificate pilot in a few calendar days! Your knowledge and experience are exceptional and your kind patience and persistence helped bring me to the finish line at times when I began to doubt myself. I will be forever grateful to you for helping me reach this goal. I enjoyed working with both you and Tony and will definitely recommend you guys. 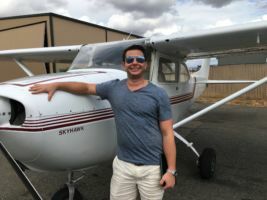 I began my flight training in the “traditional” way two years before I contacted AFIT. At that time, I spent several months with local flight schools, with multiple instructors and equipment that was outdated to say the least. Disappointed with the quality of instruction, cost, and slow pace of the programs, I elected to cease taking instruction until I found a better program that fit my busy schedule, and allowed the concentrated study that I was looking for. I found AFIT after scouring the internet, and got in touch with Tony. I was immediately impressed by the professionalism, and the organization of the course. 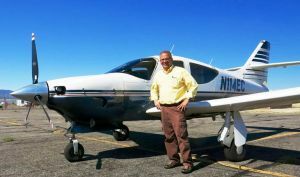 The course offered exactly what I was looking for; organization, time efficiency, and a remote location with a one-on-one instructor experience at a small airport with a good airplane. 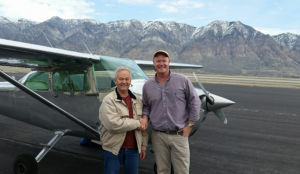 After signing up, Tony sent me a very organized and structured syllabus, and both he and my assigned instructor, Todd Gilbert, guided me through the necessary pre-planning steps to prepare for my arrival in Idaho for flight instruction. 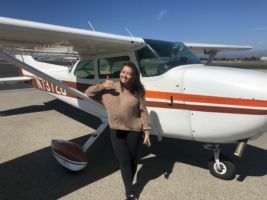 I was scheduled with an online ground school, and taken through all of the necessary steps of filing for my student pilot certificate with the FAA. They took care of every step, and contacted me when anything was needed so that when I showed up, we could hit the ground running. 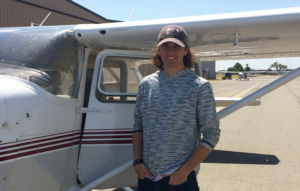 After I had completed all of the necessary steps, and passed my written exam, all that was left was two weeks in Rexburg, Idaho to complete the flight instruction and check-ride. After arriving in Rexburg, I found I really enjoyed the small town feel of the community, and the small airport we were based out of. It didn’t take long before I felt like I had made some good friends at the small FBO, and in the surrounding hangars where everyone seemed to know everybody. Todd and I hit it off immediately, and he consciously adjusted his style as we went to fit my personality, and the challenges of whatever maneuvers we were working on every day. They had me soloing on day 5, and we continued to build hours all the way until the last day. The aircraft was a great change from what I had been used to before, and gave us only one small hiccup with a magneto, which was quickly corrected by our friends at the FBO. At the end of the program, I walked away a licensed pilot, and extremely happy with my experience. This was exactly what I was looking for, and allowed me to pack a lot of experience and learnings into a shorter amount of time, rather than dragging out the same instruction over the course of months, or even years. If you are looking for a program like this, that allows you to take time out of your busy schedule, and really challenge yourself to get it all done, I recommend AFIT! 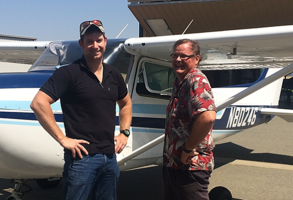 My flight instructor Michael K. was very knowledgeable in all areas of aviation. He has extensive experience flying numerous types of aircrafts, which contributed largely to the level of training I received. Michael’s teaching style reflects what I like to call a more “real life training” style. 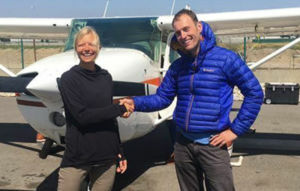 What I mean by that is in addition to the requirements, he not only will teach you how to fly and fly well but will train you on certain situations in which you may encounter in the region you will be primarily flying in. He does this using real life examples on the ground and in the air. In my first several months of flying I cannot tell you how many times his teaching points I have thought back on. 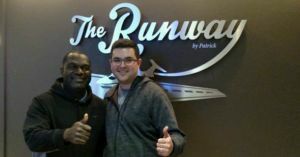 I thoroughly enjoyed our time together off the runway as much as I did on the runway. Michael is a great guy, someone who definitely makes you feel comfortable and want to be around. Best of all I can honestly say he would do anything to help his students be successful. I would highly, highly recommend Michael for anyone looking for a great education, a great friend, and a great flight instructor! Thank you for all you have done for me, I couldn’t be happier with the results. Sam is an excellent instructor, his patience with me and ability to find a training approach which suited my style of learning was exactly what I needed. Prior to your program, I averaged one or two hours a month over the course of a year and without much progress. Three different instructors during that time meant I was doing a lot of re-work and I felt my training had stalled. Ultimately that is what led me to seek out your program. With Sam we averaged four hours a day and the rest of the time was on the ground preparing me for the Checkride. 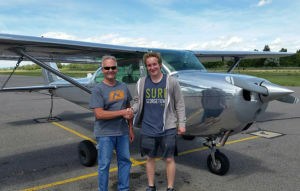 Sam brought me to my first solo in only three days! Something I would not have believed possible had you asked me the week prior. We had a lot of fun especially on cross country flights to Nappa, Modesto, Chico and Redding just to name a few. There were no surprises on the check ride and that is because Sam was sure to prepare me for every eventuality. The whole experience was awesome, and I really enjoy our time together. I’m looking forward to getting the most out of my new private pilot license this summer! and would like to continue on with your instrument rating program next year. AFIT was great. Training was very intense, long hours, lots of studying. Micheal made it fun. He used just the right amount of comedy to make it fun, but also the correct amount of sternness to make it real. Micheal is a great motivator and instructor. I would recommend this training to anyone who is serious about becoming a pilot. Thanks again for your steadfast support in getting me through the program and getting certificated. Your continued confidence in me and commitment to getting me through was key. Great concept. I personally learn better when immersed in the subject. I really enjoyed my time with Andy. I think he’s a great CFI. Whenever I was struggling with something, he’d show me the technique, and that seemed to help a lot. Andy was awesome.We were both flexible with our starting/ending times and I really appreciated that. He answered every single question I had and never indicated that “our time was up”. I can’t say enough good about Andy. All in all, I had a “Great Experience”. It ended up with me getting my Private Pilot’s License in 14-days, and that was the goal. I’m currently looking at a plane to build some hours in and I look forward to coming back for my IFR once I have some more time in the air. Thank you both for working with me! I really enjoyed my AFIT experience and apologize for not sending you this note earlier. 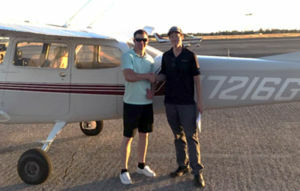 First off, thanks to you and Andy for helping me accomplish my goal of becoming a Private Pilot. 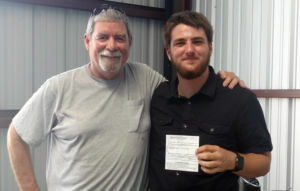 The whole process was great, from getting signed up, to last minute review for the check ride. I really appreciate your professionalism and patience, working with me to fit the training into my schedule. Furthermore, I could not have asked for a better instructor than Andy. He is very knowledgeable and confident in his skills/abilities. His calm demeanor and patience allowed me to learn in a stress free environment. I would recommend him as an instructor to anyone looking to become a pilot. I also really enjoyed the accelerated training program schedule. It was very beneficial to be fully immersed in the flight training. It allowed me to minimize distractions, get a better grasp of the knowledge (i.e ‘why’ instead of just ‘what’) and get a better feel for flying since I was doing it constantly. I look forward to continuing my flight training with you all in the future. It really was a pleasure to work with you and John. John is an incredibly skilled instructor and it is obvious that he cares about his students learning how to fly the right way. 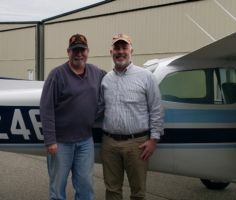 The fact that I flew solo after 3 days really is a huge testament to the type of instructor that John is and his ability to teach people these skills very quickly. It was a joy to be his student for two weeks. Not only is he a very talented instructor, he is a very fun guy to be around. I will absolutely use John and AFIT for my next rating. Thanks for giving me such an incredible experience. Thank-you for the note of congratulations. Working with you and Sam was a pleasure. The last 14 days was the final step of 3 months’ prep to PPL and the first steps in my journey as a pilot. Sam, you made me do it! We both learned, had fun and made it a success. You are a great instructor because you tailor the coaching & message to how each individual student learns. As you know, I would have loved to have flown many more hours with you or solo during my 14 days – I guess I love to fly! Tony – I know you were there in the background throughout, so I appreciate your support to Sam and I. Thank you for getting me over the finish line in my training. Rachel was an “Excellent Instructor” – we got along beautifully. Dan my examiner was amiable and very good examiner. It’s not often one can say they enjoyed the test taking experience but this is one such time. Next up will be my instrument rating…perhaps after a few months of flying. My experience with John was great. 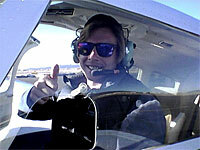 He is immensely knowledgeable in all areas of flight and is an excellent instructor. Although the intense training can be stressful at times, John was able to make it fun through his constant British humor. He was genuinely invested in my success on the check ride and shared in my joy when I passed. I hope to work with John and AFIT in the future. Thank you! Thanks for everything!! Hope to see you again. I wanted to thank you for everything. Getting started with AFIT was easy, straight forward, and every detail was explained up front (no hidden strings). That’s something I appreciate. I started training almost a year ago with a couple different instructors. Between my busy schedule, the weather, and my instructors schedule I could not find the time to train. At that time I was averaging 3 hours a month. That’s when I found AFIT and John came to town. I cleared 8 days for nothing but training and scheduled the check ride for the 9th day. By the final day, John had me more than prepared for the Final and I passed with flying colors. If your struggling to find the time and dragging it out like I was, give these guys a call. Today I accomplished a life-long goal that will help me through the rest of my life. I landed in Van Nuys two weeks ago at 5:00 AM not knowing what to expect. I was unfamiliar with the area’s environment, especially the heat, coming from the island of Maui. I met with my instructor, Gil, three hours after I landed. Luckily for me, he was the coolest “old guy” I have ever met! I felt like I was with one of my friends the whole time, but above all, Gil was an amazing pilot. 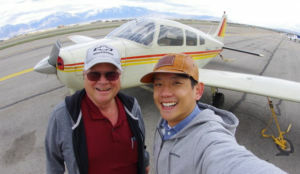 With Gil’s piloting skills and my passionate desire to learn about flying and everything that comes along with it, I was ready to start flying! 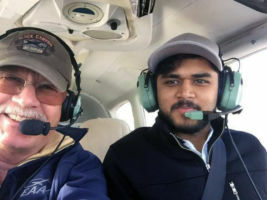 What most people don’t know is this process comes with a lot of hard work and studying, but if one stays dedicated and listens to their instructor, they can pass that darn check ride. 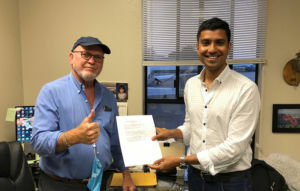 I am now a private pilot and I could not be happier with the experience I had with AFIT! Thank you to Gil and Tony for all you’ve done for me! John was such a great instructor. He knew what I needed to work on and quickly helped me improve those areas. I am so glad I went with the finish up PPL course. 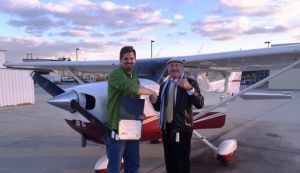 I was hesitant I wouldn’t be able to get checkride ready in time, but John helped me get to exactly where I needed to be come checkride day. Thank you so much AFIT and John for all of your help! I would like to say that john is an amazing instructor. He has patience and insurmountable amount of experience. 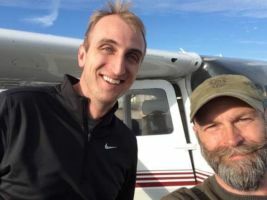 The one day out of my seven days of flying with John, that really stood out for me was when John and I did all my cross country and nearly all my solo requirements in one day. John really challenged me to go beyond my requirements and has made me a much more competent and safe pilot. Had I the time and money I would have stayed to finish out my instrument and commercial as fast as time would permit. John, Tony, and the good people at Sphere One made my experience very memorable. 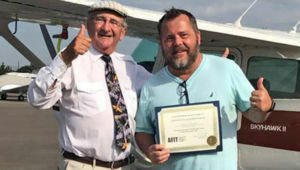 I could not be more pleased with the team at AFIT, especially Tony and Gil and their dedication to helping me finish my private pilot training. I had contacted Tony a year prior but due to schedules decided to start training at my home airport in Denver. I made good progress but was unable to finish so I reached out again and asked Tony if AFIT would help me complete my training. I met Gil in Van Nuys and dove straight into review and training completion and was finished in 9 days. The instruction, encouragement and environment were all stellar and now I’m a proud holder of a private pilot certificate. Training in Southern California had added benefits as well. The complicated airspace and literally dozens of airports allowed me to work on my ATC communications skills and overall situational awareness along with the fundamental skills needed to complete my training. I feel like those 9 days not only helped me achieve my PPL goal but they truly made me a much better and more aware pilot. Gil’s knowledge of the area, his tips and tricks and overall friendly demeanor made the training truly enjoyable. He and I really enjoyed our time together and I’m very glad I found the AFIT team. John was excellent. Tuned me up fast and had me ready in no time for the check ride. Very pleasant to be around and very knowledgeable. Check ride was really no big deal and went really well. Plane was nice and the location was beautiful and learned a lot about flying in the mountains. I will certainly use AFIT and John for my instrument ticket soon. I think you have a great operation that I would highly recommend to anyone. Exclusive access to a plane is a big attraction — and I think most (AFIT students in particular) are willing, to pay for that. That is really the second thing of 2 required to make it work — access to an excellent CFI and access to the plane. 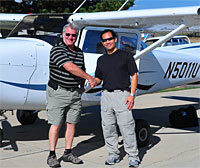 Tony, thank you for your help with my private pilot training and setting me up to ace the Check ride. John really was fantastic and I look forward to working with both of you in the future with my continued flying and learning. My experience with AFIT was amazing. From my first email enquiring about doing training, I got a call from Tony within the hour. Within a day we had a time organized and I was booked in for training within the month. My training in Hurricane, Utah was a great training venue. I hadn’t flown for 8 months and had booked 7 days to get me to completion. What I learned on day 1 was I still had a lot to learn. After day 2 I was seriously thinking about quitting and going home. We had just done a lot of time doing cross wind landings. It felt like we did it for 10 hours and at the end I have never been so mentally and physically exhausted. On day 3, I got up and had a hard think about what I wanted to achieve and realized that the day before showed me the level of physical and mental preparation that I might need one day if I got into a difficult position. That really helped me focus on the rest of the week. Eric was really patient. I had some struggles with steep turns and we must have done 100 steep turn on the day before my check ride. 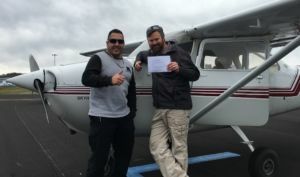 Like so many other testimonials the check ride seemed pretty simple in comparison to Eric’s training level. What an amazing feeling it is to have put in so much hard work physically and mentally and having achieved my goal. I highly recommend both AFIT and Eric. I have been given great feedback since I received my PPL about my focus on safe flying, my approach to emergency procedures and my radio work in the pattern, which I give credit to my AFIT training. Thank you for your mail. And for want of more powerful words, “THANK YOU” for helping make a childhood dream come true. As I’ll be the first to admit I was anything but an ideal candidate. In addition to having mild dyslexia, I had an issue with depth perception. Both of these make regular tasks involved with flying difficult. And Eric found these on Day 1. The easiest thing for Eric to do, would be to tell me that I wasn’t destined to be a pilot and to move on. But he did not. Instead after figuring out the issues, he worked with me long and hard, sometimes as long as 15 hour days, till we were able to overcome the challenges and I became adequate. And then good. Not just good enough to pass the FAA test. But good enough to be a safe pilot. Working with Eric was an absolute privilege. His level of motivation was unbelievable and inspirational. I’ve been through several teachers, people from whom I have learnt. And Eric finds a place at the very top. Among those whose teaching has and will continue to have an impact on my Life. And that goes beyond flying. It was a pleasure to have worked with AFIT, you and with Eric. You’ve delivered on all of your promises, in-spite of my shortcomings. Once again, Thank You. And all the very Best. Three months ago I decided to become a private pilot. Last week, I completed the mission. There’s little doubt I would have done so without support from you and your team at AFIT. In particular having Eric as my instructor, in the high density altitudes of Southern Utah, made my 14-day training both enjoyable and invaluable. I’m looking forward to experiencing the freedom afforded by my new certificate, and the challenge of earning my instrument rating. 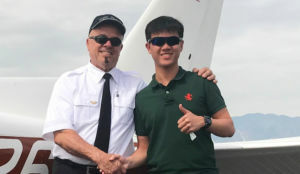 I wanted to take this opportunity to thank you and my flight instructor that provided me with the professional flight training to take me from a beginning student pilot to a certified private pilot. As you know Tony, I flew commercially to Texas and purchased a high performance complex aircraft. My AFIT instructor met me there and we started my flight training in that aircraft. Within a week I soloed. 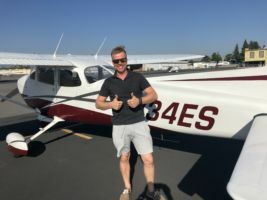 When I initially inquired about your company and this total immersion flight training, you explained the process and it sounded convincing and just what I was looking for. However, I was still a bit skeptical. 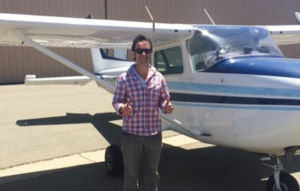 I was unconvinced how I could learn to fly and be a competent private pilot in 14 days. Well, that is because your program doesn’t shortcut any training, it is a total immersion of everything required and beyond. The training is so professional and so thorough, I could not help but to succeed. Tony, you were truly committed to see me through this and you did. For all of those skeptics out there of which I was one, if any of you are considering accelerated flight training, do not hesitate to go with AFIT! I will not forget how much you assisted me with getting this flight training completed successfully. When I look back at the whole experience from the perspective of a new day I have only positive thoughts. Two weeks ago today I had never even sat in the left seat of an aircraft let alone flown one. I have learned a tremendous amount about piloting and aviation in this really very short time, both knowledge and skills. That I was even ready to attempt a check ride at the FAA minimum hours is really a testament to your skill and tenacity as a flight instructor and I thank you greatly for that. You employed just the right amount of demonstration and encouragement along with a demand for solid fundamentals of flight from me. Lesser instructors would not have arrived at day 14 with me feeling as prepared as I did. Thank you for the time and effort you put in to making me a pilot. I really appreciate it. 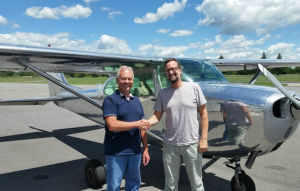 As you know, In December of 2015 I worked with John at KVNY on my Private Pilot certificate. 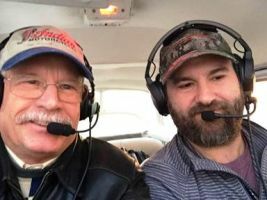 John was a great instructor, he was very focused and made sure that I would be a safe pilot anytime I was acting as PIC and not just for the check ride. Despite dealing with weather John was able to figure out how to make sure that I got all of the training I needed to qualify to take the practical test on time. John is full of knowledge and was very eager to pass it on to his students. The entire experience was great, I learned so much and had a great time. 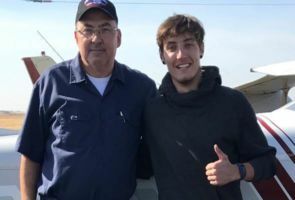 To top it off a week after I passed my check ride I was getting checked out at my local flying club to fly their airplanes, after landing the instructor said that he was very pleased with the flight and that I must have had a great instructorť because I really knew my stuff. That one comment is very telling of how good of an instructor John is. 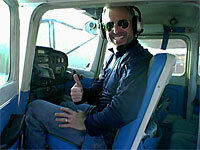 I wanted to take a brief moment and write about my recent flight training with AFIT. The training location in Van Nuys and the Instructor Gil were the absolute best combination. I wanted the busy airspace experience and a qualified Instructor to teach me. Gil was very easy to get along with and had great teaching abilities. Gil is defiantly an asset to AFIT and I would recommend him and AFIT to anyone who asked me about flight training. All the CFI instructors in the little town where I live thought it was absolutely crazy that I was attempting the accelerated flight training. 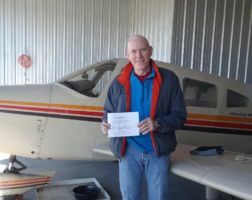 With me back home and holding a TICKET in my possession they are all astonished that I was able to achieve my private pilot license in such a short amount of time. That’s not all either I actually am very comfortable flying and looking forward to my private pilot excursions that will follow. Once again a million thanks to AFIT and Mr. Gil for making the dream a reality. AFIT’s program was the only way that I could schedule the time to earn my certificate. I followed Tony’s instructions to the letter, carefully preparing for the written exam and getting my pre-flight schooling completed. 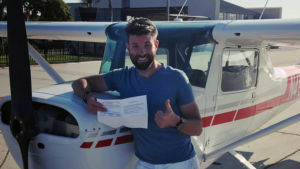 I’m glad I did because at the last moment I decided to earn my certificate in a complex, high-performance 7-seat turbo aircraft that I purchased. Every flight instructor I spoke to thought I was nuts; but when Gil arrived we went straight to work. Gil has the unique ability to read his students and understand when they need encouragement, empathy or a good old-fashioned kick in the rear. He never complained even though it took me over 150 landings to ease us onto the runway. 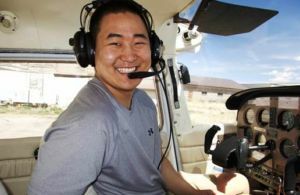 He is a kind person and a fantastic instructor, helping me ace my verbal test and check ride with just 11 days in the air. I now fly cross-country 6-10 hours a week and feel completely confident. I had an excellent time with Todd Gilbert. I never would have thought that I would be able to achieve my pilot’s license in two weeks. Todd and I flew, studied for my written and he was able to help me achieve one of my life long dreams. Todd has great knowledge about aviation and is very easy to get along with. He was a very informative teacher and made everything very simple to understand. I couldn’t have done it without your course. I’ll see you guys for my instrument rating. Thank you for help and support. I just wanted to say thank you for the professional and educational experience that you provided through AFIT’s Private Pilot program! I am still shocked that I was able to accomplish my PPL in 14 days!!! I could not have done it without Tony’s expert coordination and John’s incredible instruction. I really appreciated John’s teaching style and am grateful for how patient and insightful he is. He was always able to communicate things to me in a way that I understood, and gave me helpful tips for how to apply what I was learning in a practical way. While there was a lot to learn, I never felt behind and I always felt like I was getting the best instruction. I had started trying to get my PPL a year ago with another flight school, but scheduling a plane and instructor after work was challenging, and the training felt so slow. I only accomplished four hours of flying before I had to quit due to a hectic work schedule. When I heard about AFIT, I knew this was the program for me. It was definitely worth it to take two weeks off work and knock all of the training out in an accelerated manner. 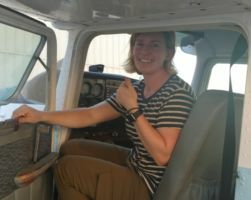 This was the perfect solution for me, and I am excited to come back and get my instrument rating! I would highly recommend this program to anyone who is serious about becoming a pilot and wants to do so in a timely manner. Thanks again, and Blue Skies! I just wanted to drop you a note to tell you how impressed I was with your course. John is an excellent instructor and I am very happy with the experience I received and my training. I will most likely be in touch for an instrument rating in the future. Imagine wanting to obtain your private license in a high performance plane, like a Cirrus SR22. Imagine everyone telling you that you are crazy to do it in such a plane in such a short period of time. Well, I can tell you that it can be done, because I did it. And but for AFIT my desire to quickly obtain my private pilot license in an SR22 would not have become a reality. John was beyond an exceptional instructor. He was both tough on me, but also extremely understanding and patient during my training process. While many people may have doubts about accelerated training, I cannot see another way to do learn how to fly. It was so important for me to go through the daily repetition of flying, that after the first 4 days it was as easy as just getting into my car. Tony was extremely helpful as well in accommodating my busy schedule as a trial attorney that often sees many unexpected changes because of trials and deadlines. In addition, Tony was honest in sharing with me some of the challenges I would face in training in such a high performance plane. My experience with AFIT was a 10/10 and I highly recommend this to everyone who desires to learn how to fly. First off, huge thanks to my instructor, John T. for making the learning process as experiential as possible. John’s approach to ground training always felt more like a conversation with a trusted friend than a formal class, and his extraordinary depth of knowledge in all facets of aviation meant that there was seldom a question to which he didn’t have the answer. 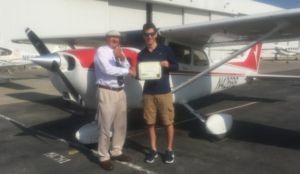 He kept me laser-focused on the knowledge I would need for my FAA oral test and check ride, but he still found time to impart untestable yet critical lessons that he has learned in his 40+ years of flying. Like many novice pilots, I struggled with landings. John proved to be extraordinarily patient with my learning process. He applied several different teach techniques until he found the one that resonated with me and it all clicked. He held my hand during new maneuvers and situations just enough to ensure that I was safe, but he let go often enough to ensure that I learned something from my mistakes. 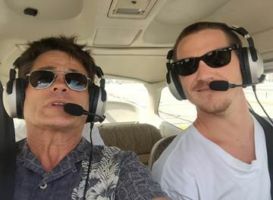 I am confident that I am a better pilot for it, and I truly appreciate the high standards that he set for me, which made my check ride just another day in the plane. Learning to fly with A.F.I.T. was one of the best decisions I’ve made regarding value, & good quality flight instruction. John is a “Grade A” instructor. I got my ticket in 42 hours, & I credit John for getting me through in just over the minimum- He has an eye for detail, & doesn’t miss a thing in the aircraft. I also found that he consistently challenged me to do good, & pushed me to get better in the plane. In retrospect, I’m glad I chose A.F.I.T. as I know I would’ve likely dealt with “revolving door” issues from a training facility that had “time-building” CFIs that have no incentive to help you get your ticket in a timely manner. Hands down, the best money I’ve ever spent! I wanted to send a letter of thanks for the opportunity that you and John have provided to me to fulfill a life-long dream. I have to say that the 14 days was action-packed and very exciting. There wasn’t much time for distractions and I think that is one of the main reasons this program is so successful. I tried a couple years ago to get my certificate and the normal day-to-day distractions of running a business and having a family kept me from realizing the dream. Your program worked! John was an excellent teacher and coach throughout the whole 14 days. I really enjoyed his teaching methods as well as his company and personality. The training I received with Lou was better than I had hoped for. The entire process was very structured and well planned out. I enjoyed the experience I had with Lou, “great instructor”. He and I enjoyed a further bond with our military background. I plan on returning when my schedule permits me for an Instrument rating and multi rating. When I came to AFIT I had felt my previous arrangement was taking too long and costing me more money. I wanted a program with a curriculum and structured base, that’s exactly what I got. Lou was able to find out where I had left off knowledge and flight wise after the first day. I really liked how easy it was to communicate with him and decided how to approach the next few days in order to knock out as much as we could and as safely as we could. I highly recommend AFIT and Lou. I hope to be back in Texas to take care of further ratings and such. What an incredible experience! 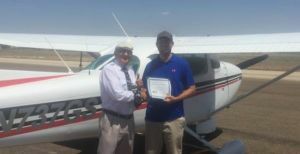 Almost hard to believe that I showed up in St. George, Utah with only a few hours of flight time under my belt, and 14 days later I am a Certificated Private Pilot! Eric is absolutely great at what he does. He knew exactly how to push, stretch, set expectations, and keep the whole learning process fun and on track. He is an expert! Truly a professional. Very committed to seeing me succeed! 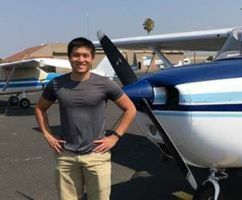 I highly recommend AFIT and Eric if you are serious about becoming a private pilot in the most efficient way possible! I wanted to express to you what a great experience AFIT was. 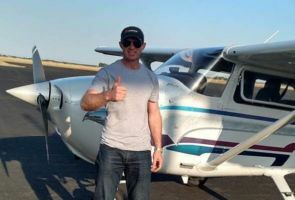 From the first phone call I made to the final day when I received my private pilot certificate, I received prompt responses to my calls, questions and emails. I never felt ambiguous or unsure about where we stood in the process. I could not have had a better instructor than Eric. Not only is he incredibly knowledgeable, he truly cared about me becoming a SAFE pilot. He was there from sun up to sun down (and somedays longer)making sure we stayed on track and did not waste ANY time. This was very important as I had expressed to you on the phone that I was ready to work hard to achieve the certificate. It meant everything to me that I was provided with an great instructor who was more than ready to do the same. I received A+ quality training in a time period and price we had discussed prior to my payment. What a great service AFIT provides in an industry that seems to do everything but that. I would recommend AFIT to anyone who is serious about receiving great instruction in a timely manner. Cholena was great. I really appreciated her patience and knowledge. She was quite a refreshing take on flight instructors because I have had a few rather rude ones. I had to get my pilots license this month for my Air Force Pilot’s application. I can’t thank Cholena and AFIT enough for helping me complete my process. Great Job…. Thank you for helping me complete my Private Pilot License. As you know I had been working on this for years and my previous instructors just kept telling me how hard the practical was going to be and for the oral I had to know “everything”. So, thanks for helping me focus on the key important items and getting me through my oral & practical in such short time. You made it happen despite two scheduling changes and Northern California midwinter weather. I appreciate your teaching skills, enthusiasm and sense of humor. Thank you for all your hard work! 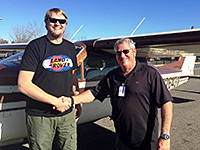 John was the perfect professional during the entire process, a natural flight instructor. Even though we lost some time due to abnormal weather, we still finished on time. I was very impressed with his methods and would definitely use AFIT again. 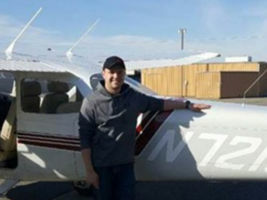 Overall, I had a “great experience” and it was a vast improvement over the flight school I was using before. I would like to thank John my instructor, not only for helping me get my Private pilot’s license in 40 hours but for becoming a great friend. He is a “Great Instructor” and a great person to be around which made my training not feel like a school but just another day with a friend who has great knowledge in aviation. I don’t know of anywhere else that someone can learn in that short of time and feel as confident and as proficient as I do with the instruction. 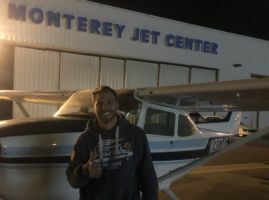 After completing my check ride, I flew my own plane home on a 3 hour flight with confidence and ease. I am grateful that I was able to have such a knowledgeable instructor that I rate as second to none. Thank you AFIT and John for everything that you have done for me, I will recommend my experience to anyone interested in aviation. I look forward to continuing my training into IFR with AFIT and John in the future. I have had a fantastic week in Addison TX with Lou and I’d like thank you and AFIT for everything. Lou is a fantastic instructor! I had 80 hours of instruction prior, but still had cross-country solo work to do as well as a number of other requirements to wrap up. Lou was able to diagnose my failure points immediately and got my skills up to PTS standards in a matter of days. Experience makes a difference! 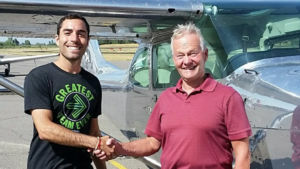 I’d highly recommend AFIT and Lou to anyone interested in flight training. There is none of the “time building” and “dollar wasting” activities you may find at other flight schools. You may pay a little more through AFIT from the hourly cost perspective. However, you won’t spend as much time learning so your total cost is less. Feel free to share my contact information, I will give a hearty two thumbs up for AFIT and Lou. Thank you Tony and Cholena for making a dream of mine a reality. Anyone who is skeptical about an accelerated program really shouldn’t be, and I’m proof. After struggling with instructors schedules, meeting with multiple different instructors, forgetting what I learned and spending much of lessons relearning everything, I found AFIT. Before AFIT, I felt like I was tiring out an instructor if I wanted more than the normal 2 hours typical lesson. The instruction was everything you told me it would be Tony when you signed me up. The plan was completely laid out from start to finish, I felt like every day had a purpose. 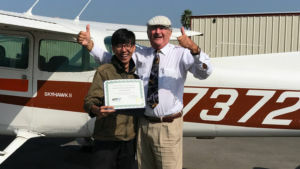 The program is great it not only prepared me for the checkride, but made me a confident, proficient and safe pilot. I had struggled to get my pilots license for three years . Weather, timing, money and business all contributed to such a long road. I’ve been to four different FBO’s, and had numerous low time flight instructors. At 80 hours I had learned the basics, however my skills were poor and I still needed night landings and solo time to finish my requirements. After calling several accelerated flight programs throughout the country I finally talked to AFIT. Tony assured me that I was no different than many of their other clients and he was glad to help me. Tony scheduled me with John at their Boulder, Colorado location. 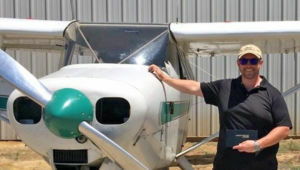 “John was the instructor I needed.” He has thousands of hours of dual given and 40+ years of experience in aviation. We started working immediately. 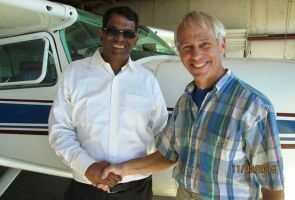 John evaluated my flying skills and aviation knowledge . After identifying my numerous flaws and bad habits, John was actually able to teach me how to safely fly a single engine aircraft . The whole process only took 10 days of actual training. Now that I have my pilots license I will definitely use AFIT for my instrument rating. Many Thanks AFIT. Training with AFIT was a “Great Experience.” John was always Professional, Enthusiastic and really went out of his way to make sure I understood the material. I’m looking forward to aviation being a part of my life and will definitely be back with AFIT when I’m ready to pursue my instrument rating. Thank You! 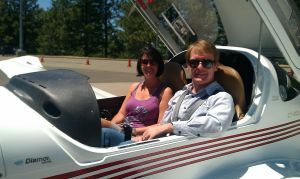 My flight training with Todd was wonderful! He really helped me understand a lot of concepts I’d been struggling with and I now feel that I’ll be a safe and competent Private Pilot. Despite weather delays that impacted both the training and the check ride, it all got done. I look forward to working with AFIT again soon! Today I finished my PPL. I passed my check-ride with flying colors. Also my baby girl was born late last night at 9lbs 1oz. She is so beautiful and amazing. This has been an amazing year. I want to whole heatedly thank AFIT and John for all the skills taught me during my time in Colorado. John helped me obtain a life-long goal, and I am very appreciative for the time and talent. Thank you for all your help on my way to finish the instrument rating. I was always very impressed with the fast, thorough and patient responses to my e-mails, even when I sent them late in the afternoon or even during the evening hours. The positive impression I gained from our discussions was very comforting, I therefore decided to finish my instrument rating with you. 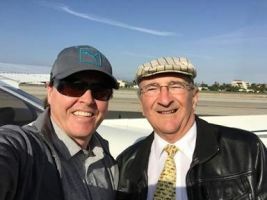 I flew from Michigan to California to meet with John at the Van Nuys Airport. 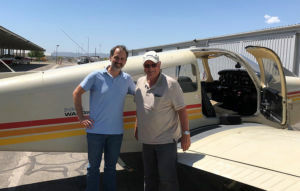 On the same day we began with the training and an initial flight to get me accustomed to the plane and the airspace as well as to give John an idea of which topics had to be covered and what needs to be practiced in order to get me ready for the instrument check ride. 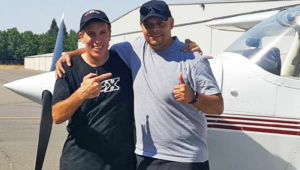 John is a great and experienced teacher who did an excellent job with pushing me to my limits but also with polishing my skills and in deepening my understanding of the instrument flying system. I learned a lot from John, inside and outside the plane, about flying and aviation in general. The check ride took place on January 1st. Thanks to the intense training with John, his constant pushing and pointing to things that I missed during the training, I passed with flying colors. Is there a better way to start the New Year? The G1000 equipped Cessna 172 we used for the training was fun to fly and in great condition. It was a great and thoroughly enjoyable experience working with John. I don’t want to imagine, how much more time I would have had to spend in Michigan (conditions are currently 5°F degree F, snow and ice) to finish the instrument training. Thank you, I will certainly recommend AFIT and John to other pilots. Just want to say thanks to you both (Tony and John) for the finishing course for my PPL. From calling on a Friday to starting flights on Monday it was great to walk away 7 days later with my Private Pilot’s License. John did a great job of blocking off time for an airplane ensuring I could make the timeline while working with me to make sure I was confident for the check ride. I had 36 hours over the previous 5 1/2 months and now have my license and 60 hours. A teacher is only as good as their ability to impart knowledge, and Eric is exemplary. He has a way of reducing complex aviation concepts into digestible pieces. He is able to explain, re-explain, and then interpret his explanation until his student comprehends. Eric is long on patience and is meticulous in his instructing. Accelerated courses must have been designed around Eric, as his ability to teach flight in 13 days is down to a science. He also walks the exact same walk that he expects of his students. If I went home exhausted from a long day of flight, I knew that Eric was still working. He cares about his students success because he cares about putting safe, competent, and critically thinking pilots out into the sky. I appreciate that I have been connected with him and am grateful for the above-and-beyond instruction I received from him. I am a better pilot than many other instructors could have produced. 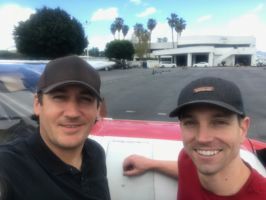 Any advertisement is only as good as it’s product; AFIT is extremely lucky to have found a fit with Eric and I am glad that it connects him with exactly what he was designed to do- teach people how to fly. Thank you for the experience! Tony, thanks again for the connection! You’ve got a great product with AFIT! I just wanted to write to you to sum up the 14-day PPL course I took in Boulder. John was a great instructor and a total professional. He knows his stuff! 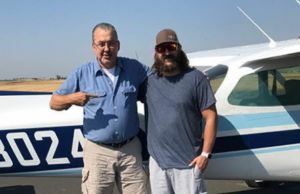 He spent a lot of time teaching me how to “be one with the airplane, kimosabi”, and it was certainly helpful – I passed my check ride on the first try! As you know, I flew out from California to do this course, so finishing on time was very important to me. We hit a patch of bad weather, and I was worried that I’d be headed home without my license. But John kept us on track! As soon as we had a good day, he pushed me to knock requirements out, one after the other, and I ended up completing right on time. Keeping my goals in his mind and helping me get to them was very much appreciated! Thanks to you as well, for dealing with the scheduling twists and helping me to get this done! 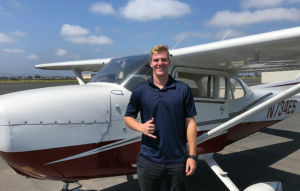 My experience with AFIT was professional from start to finish, I’m thrilled to be a new private pilot, and I’m looking forward to flying in California in the days to come! 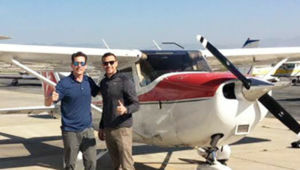 Tony, I had a great time doing my flight training. It worked out really well. I felt like John really likes what he does and he knew what areas to focus on to get through the testing. The examiner said I knew everything exactly like he hoped and better. He also said it was about essentially a perfect score, which is always good to hear. I want to thank you for all AFIT did to help me get my private pilot license, purchase a plane and get a high performance endorsement. I was amazed when you helped me look at ads for planes and advised me as I made an offer on the most promising one. I was also impressed with the flight instruction I received from AFIT. 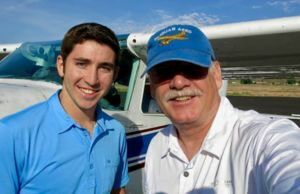 John did an excellent job building my skill and confidence while I learned to fly in very busy airspace. It has been gratifying to build piloting skills so quickly. 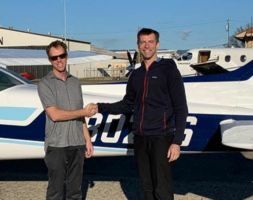 John saw my training through to the point where I passed my check ride and got transition into the Cirrus SR-22 I purchased. It was a pleasure to work with AFIT and I look forward to getting my instrument rating with AFIT in the future. Thank you Tony! It was a great experience. Where to begin? Working with Gil was a whirlwind of an experience! 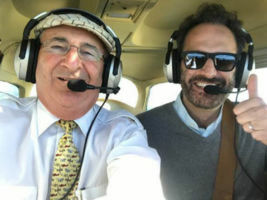 I talked with him a few times on the phone before I met him to start the 14 day Private Pilot Course and once it began, there was never a chance to look back! We started flying on day one and kept it up. Every day was learning something new to prepare me for the FAA check ride. After learning the different flight maneuvers, takeoffs, and landings it was a matter of honing these new skills for the check ride. By the time the check ride came around, Gil had me well prepared for both the oral portion and practical portion of the exam. I passed both on my first attempt and am proud to say I am a certified private pilot. This would not have been possible without the help of Tony and Gil at AFIT. Communicating with Tony was a breeze, as he was very prompt with his emails and phone calls. Gil is a fantastic instructor. 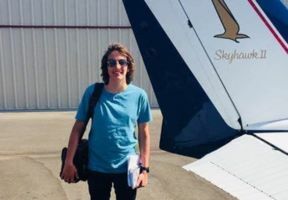 He knows the minute details of flying and what the FAA is looking for from student pilots and how to bring that about from whomever he is instructing. I look forward to becoming a better pilot and visiting AFIT again to earn my instrument rating one day soon. My experience with AFIT has been great, I originally signed up for a 7 days PPL finish up and ended up passing my checkride using only 6 days. Tony you have been very responsive to any email and inquiries answering in a matter of “minutes” regardless of the hour. I really appreciated that timely and clear communication. Andy is a phenomenal instructor. One can really feel his 22,000 + hours during flight training. He is always intimately knowledgeable of what the airplane is doing and why it is doing it. His teaching is very effective and on top of that, it has been a real pleasure to work with! The AFIT program was a perfect solution for me. Previously it took me 3 months to get 8.8 hours of flight time. During which every flight I had to relearn half of the previous information. I finally made flying a priority and was able to utilize AFIT and Andy’s help to achieve a life long dream of becoming a pilot. Andy and his family were nothing but kind and welcoming. 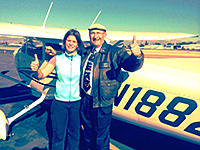 Andy is a very knowledgeable and experience pilot, I have nothing but great things to say about my 2 weeks in Lincoln CA. While I was there, I was able to go from 8.8 hours that I previously had to 53.0 hours and a pilots license. Andy’s teaching style allowed me to make my own mistakes and learn from them while remaining safe. He was very hands off the entire time, and with his instruction I was quickly able to gain confidence and solo within the first week I was there. The learning environment was very comfortable and I never felt talked down to, in fact questions and learning, why, instead of memorizing facts were encouraged. I feel as though through my questioning and his very in depth answers, I got more of an education than what was required of just a private pilot. We covered how every system in the aircraft worked and why, the advantages of certain types of systems over newer or older systems and how to even perform some small maintenance tasks. (extremely interesting to me due to my military background in avionics maintenance). I plan to use my flying experience to work towards becoming a military fighter pilot. Thanks for putting on a fantastic program. What an incredible two weeks! I came across AFIT after becoming frustrated with the slow pace of my training here in New York – things like constant cancellations due to weather and only being able to fly on weekends, which I’m sure a lot of student pilots can sympathize with, were getting me down as I realized it would probably take me a good 8-12 months before I’d be checkride ready. I had the benefit of coming to AFIT with ~33 hours in a Cessna 172 in 2011, and more recently, about another 8 hours between June-July this year flying in the busy New York airspace. 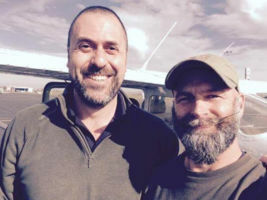 Michael was a fantastic instructor that dove right in and pushed me to my limits each and every day, both tailoring every flight to very specific purposes yet ensuring I never forgot how much fun it is to actually get out there and fly. Even on the first day in an immaculate condition 1978 Cessna 172, I felt like we did more flying in a single flight than I’d done in my previous 40 hours combined! Taking off from Van Nuys we headed over the hills to Santa Monica, maneuvered low and slow over the many boats whilst practicing ground reference maneuvers, took it down low and zoomed past the pier, tracked back over KSMO and orbited the L.A. downtown area, flew over the plethora of mansions in the Beverly Hills area and got some great snaps whilst zipping past the Hollywood sign, nipped over to Whiteman then Burbank for some pattern work, then headed out to the Mojave Desert’s boneyard airport to practice some insane crosswind landings (90 degrees and at least 15-20 knots! ), then simulated instrument flight back to Santa Paula where we stopped and got some fuel, then shot an ILS approach on the way back to Van Nuys. Final tally was north of 20 landings and 3.5 hours XC time. In a single flight! On the first day! That was mind boggling to the student pilot in me that was used to the usual (boring, in retrospect) “takeoff, practice area, maneuver, head back and land”. I ended up soloing in the pattern at Whiteman on day 3 (then immediately being sent out to practice pattern work hopping between KVNY then KWHP), did my first XC solo to Santa Barbara with a gorgeous picturesque sunset accompanying me all the way back on day 5, did my long XC down to Palomar (north of San Diego) on day 6, then ended up sitting my checkride six days early on day 8! That was absolutely unexpected and a testament to Michael’s ability as an instructor to continually get the best out of me and tailoring everything to maximize my time in SoCal. 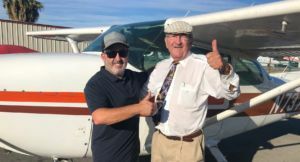 With six days up our sleeves, I ended up getting my tailwheel endorsement after two intense full on days flying a beautiful 1948 Cessna 120 taildragger… and then complex and high performance endorsements (and a flight to Vegas!) in an awesome 300 HP retractable gear constant speed Piper Saratoga. It was an unforgettable experience overall and I could not recommend AFIT and Michael high enough! I can’t possibly say enough positive things about my experience with Todd and the accelerated program. 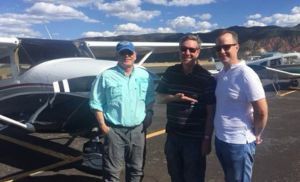 Rexburg had ideal airport access and was a great jumping point for gorgeous and challenging cross country flights in and around the mountains. Todd made the training fun, safe, and efficient. All in all, it was an amazing 10 days and am proud to have walked away feeling confident and very comfortable flying with my license in hand! I hope to fly with AFIT and Todd again in the future for other certifications and my instrument training… but for now I’m enjoying my first few weeks as an official PILOT! Thanks again. I’ll be in touch early next year or so when I start planning for the next steps! The AFIT team did an amazing job at working me in on short notice with a strict time line. 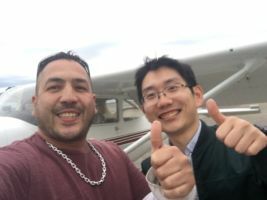 Erwin my instructor maintained a goal oriented mind set and was willing to put in the extra effort and long days to complete the necessary flight time and requirements in order to complete my private pilot license training, in less than the normal 14 day program. I was able to attain my pilots license in 12 days. I could not have done it without the dedication of my instructor. A special thanks to you Tony and the awesome service and support from the folks at Lincoln Sky-ways. Thanks again for everything. Just wanted to send a quick note of appreciation to you and the AFIT program. 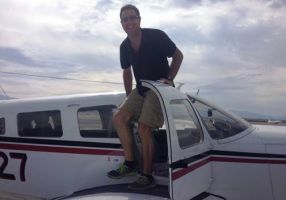 I’ve been dreaming of getting my private pilot’s license since I was a teenager, and I’ve tried throughout the years to commit the time to get all the hours in – to no avail. When I saw your 14-day program, I knew it would be the best way for me to finally achieve that dream. 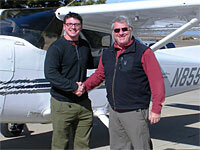 My CFI, John could not have been a better fit or a more experienced, capable instructor. 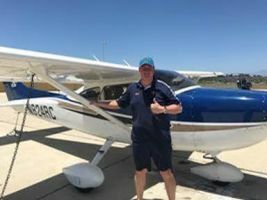 John has the perfect personality for flight training – he introduces information in a logical, straight forward way without making it overwhelming, and he has a great blend of patience, persistence and expectation that make you want to get up each day and jump in the plane. 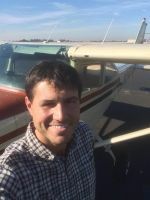 I would highly recommend this program and John as an instructor to anyone looking to gain their private pilot certificate in a short period of time. I wanted to follow up and thank you for delivering on the promise AFIT gives it customers to get up in the air and get flying! I owe every bit of this new passion of flying to AFIT and your incredible flight instructors. 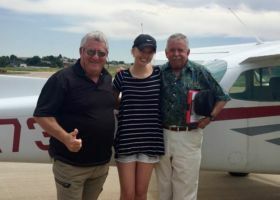 Both were just great to work with and each certainly pushed me as I worked my way up from knowing very little about flying and/or about aircrafts, to earning my private pilot license. 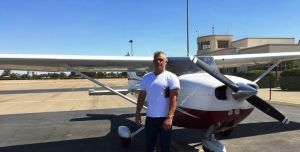 AFIT, and accelerated flight instruction, was perfect for someone like myself with a busy work and travel schedule to earn a license in the most efficient way possible. 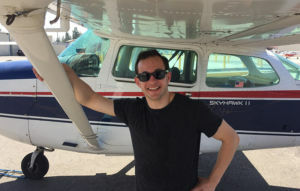 I knew that if I held to the conventional method of weekly instruction at my nearest flight school, an hour from home, I may not have had the time over the course of the program to stick to the schedule. I most certainly would have regressed over weekly and monthly classes. 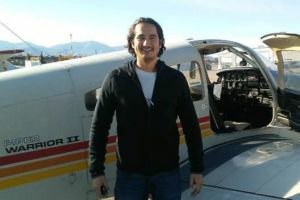 With AFIT and the one-on-one daily instruction, learning to fly was engrained in my mind in a routine and daily basis. Thank you AFIT!! The program was everything I expected, and more. The Rexburg training center in February was extreme weather conditions. Being from Texas I flew in conditions I would have never encountered at home and for that I am thankful! Todd is a very personable guy, and so easy to get along with. Made me feel very comfortable and at ease. I highly recommend AFIT and the staff. The two week accelerated private pilot program were the most challenging and rewarding weeks of my life. Day one I was worried about taxing the plane, day 6 I did my first solo landing, day 9 first solo cross country, by day 14 I was ready for my check ride. It’s incredible what you’re capable of doing in a short period of time, especially when you have a patient and passionate instructor like Jason. He showed up every day with a smile on his face and a tactful way of pushing me to my fullest potential. Looking back, today, with the license in my hand, smile on MY face, I wouldn’t have done it any other way….thank you!!! Thank you again Tony, it was honestly a pleasure working with Jason, I got lucky. As a fresh private pilot license holder I would like to send an enormous thanks to the A.F.I.T. team for helping me achieve this great feat. Most of all I would like to thank Erwin for putting in the effort to train me from dusk till dawn, day after day to be the safe, professional pilot I am today. Erwin didn’t cut any corners in my training and it is obvious to me that he takes great pride in instructing his students. In my brief time as an aviator I have witnessed numerous other pilots behaving like complete amateurs. 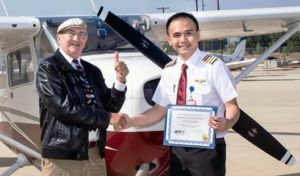 I’m glad to say that Erwin game me the proper training and set me in the right direction so that when I’m in the sky I will be setting the example for others that have had instructors that lead them wrong. Erwin made the most of our time and never for a moment gave up on me. Erwin constantly challenged me to give me the best odds to passing my check ride when the day came. An accelerated flight program can be very stressful on a student and at times Erwin and I found ourselves laughing until our eyes were watering. It was this aspect of my training that I believe kept me from going insane. 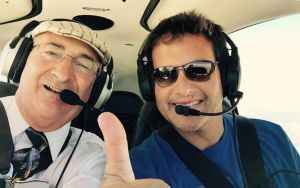 Through the flight program I not only gained my pilots license I also gained a friend that I have spoken with various times since I have finished training, and I feel that I can approach at any time I need guidance or advice. I would also like to thank you Tony for working with me from the very first email to after completing my training. Some of the obstacles I encountered were in neither of our control but I am very thankful that you worked with me to give me a fair chance at finishing my flight training and obtaining my certificate. 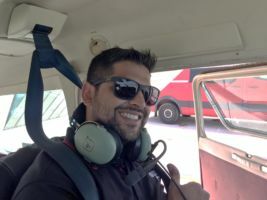 Overall I had a great experience with my flight training, and even though at times I wanted to jump out of the plane (without a parachute), in the end I am glad I went with A.F.I.T. to get my training and I would do it again without any doubts.When the time comes for me to seek additional training I will definitely be getting ahold of you for further business. 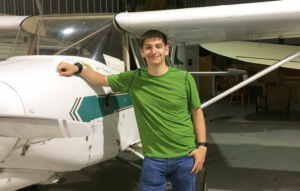 Looking back, it’s hard to think that I came to AFIT not even knowing how to start an airplane and after only 6 days I was doing my first solo flight. Being fully immersed in the course was definitely the best choice as it helped everything come together as I kept building day after day. It’s great to be able to look back and see that only after two weeks, I have my pilot’s license. First of all I have got to say that my flight instructor Mike is an amazing guy and secondly a great flight instructor. The AFIT course was above and beyond what I expected of it and I couldn’t have been happier with the staff, facilities, and equipment. Mike made my experience one to remember as he went out of his way to make sure I not only passed my test but had a great time training. Mike I can’t thank you enough sir and consider you a good friend. I can’t wait to come back and get my instrument rating!!! 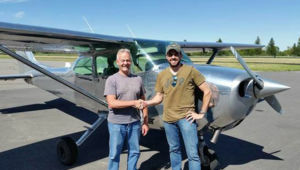 I spent ten days out in Lincoln California to finish up my private pilot certificate, and I couldn’t have been happier. I started my training in a 141 school. The program was billed to me as a two-year program (since I had my gen eds out of the way) where I would finish with my four-year degree as well as a commercial certificate and maybe even my CFI certificate. That two-year program looked more and more like a three or four-year program just to get the flying done. The school spent a lot of time theorizing about how to get the max time from/for students, instead it pushed me behind. They also employed low time instructors (about 500 hours) who would spend several months trying to diagnose a problem. When I got fed up with the games I did some research and turned to AFIT. The training was a lot more intense. Coming into AFIT I had about 30 hours and had not solo-ed. In the ten days I was with AFIT I flew more in ten days than I had with my previous school in six months. My instructor Andy, wonderful man, worked with me and had me flying solo in what seemed like no time after having been at a school that took over three months to teach me to properly land. He gave me a lot of tips and tricks to flying that a lot of younger kids may not think to teach. I don’t think I could have asked for a better instructor than Andy. While we certainly flew a lot, he made it a point to take breaks so that I was not completely burnt out. Both 61 and 141 schools have their benefits, but for me starting 141 and ending 61 worked out wonderfully. Using the AFIT finishing course was definitely one of the smart things I have done with my aviation training path. Had I stuck with my former school I am certain that I would still be several months behind and not been able to catch up. Throughout the sign-up period where I was paper pushing left and right to make sure that when I got 2,000 miles from home everything would be in order, Tony was there. While I am certain that there are people coming to this school from a lot farther away than me, I knew that I would be able to reliably get into contact with Tony even though I was three-time zones away. He was very responsive and worked with me when papers needed to be filled out.